In the February 2015 edition of The Journal of Finance, a well known academic paper, “The Pre-FOMC Announcement Drift”, was finally published, almost 4 years after the working paper was released in the public domain in 2011. Authored by researchers, Lucca and Moench, at the US Federal Reserve, it documents the tendency for the S&P500 Index to rise in the 24 hours prior to scheduled FOMC announcements. However, perhaps somewhat surprisingly, no such pattern is observed for interest rate markets like Eurodollar rates or 10-year Treasuries. The paper can be downloaded from here http://onlinelibrary.wiley.com/doi/10.1111/jofi.12196/abstract. Since it’s been public information for some time now, I thought it would be interesting to check whether the drift continues. In this post, we’ll first try to reproduce the essential result of their work (in-sample) and then look at the post-public domain results (out-of-sample). Note, we won’t be trying to exactly replicate their research, but will use other interesting quant techniques nonetheless. …show that since 1994, the S&P500 Index has on average increased 49 basis points in the 24-hours before scheduled FOMC announcements. As we don’t have ready access to such data, we’ll use daily close data for the S&P500 ETF (SPY) as a proxy. You could think of this as also checking the robustness of their result, by shifting the return calculation from 2pm to 4pm. 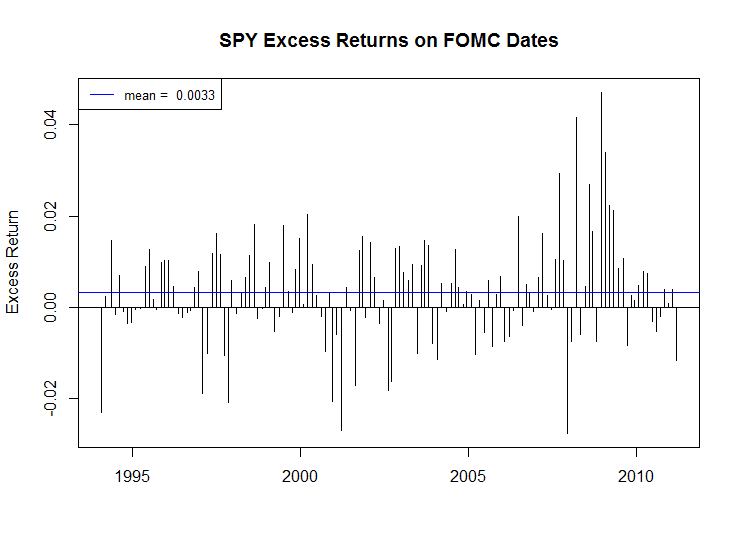 In addition, their post-1994 sample was conducted from September 1994 to March 2011, but since we have both the SPY price data and the FOMC dates (from my previous post here http://www.returnandrisk.com/2015/01/fomc-dates-full-history-web-scrape.html), we’ll define in-sample as the period from January 1994 to March 2011, and out-of-sample as April 2011 to January 2015. Also, since we can easily get risk-free rate data from the Kenneth French Data Library http://mba.tuck.dartmouth.edu/pages/faculty/ken.french/data_library.html via Quandl, we’ll conduct our study using excess returns i.e. simple SPY percent return less risk-free rate of return. 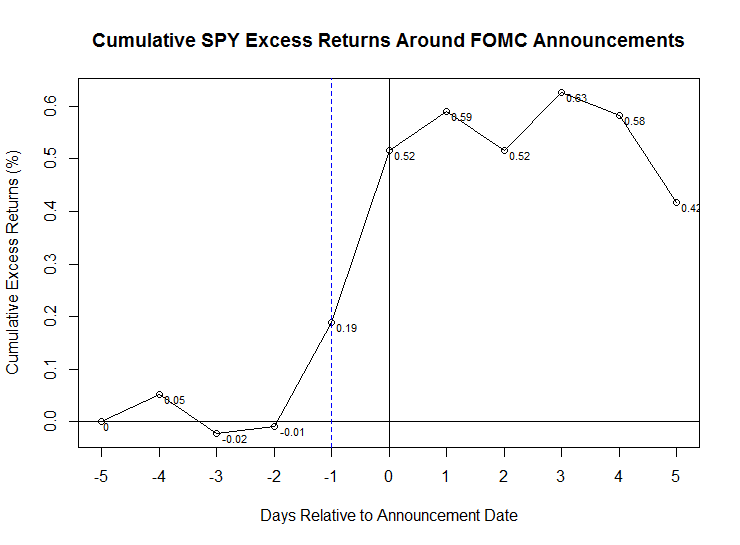 # TBill rate from Ibbotson and Associates, Inc."
The event study chart below clearly shows the pop in the SPY returns in the 1-day period before the FOMC announcement, which in our setup is about +0.33% (0.52% - 0.19%). This is the key finding of the paper. In addition, there is a noticeable drift higher on T-1 of +0.20% (0.19% - -0.01%). 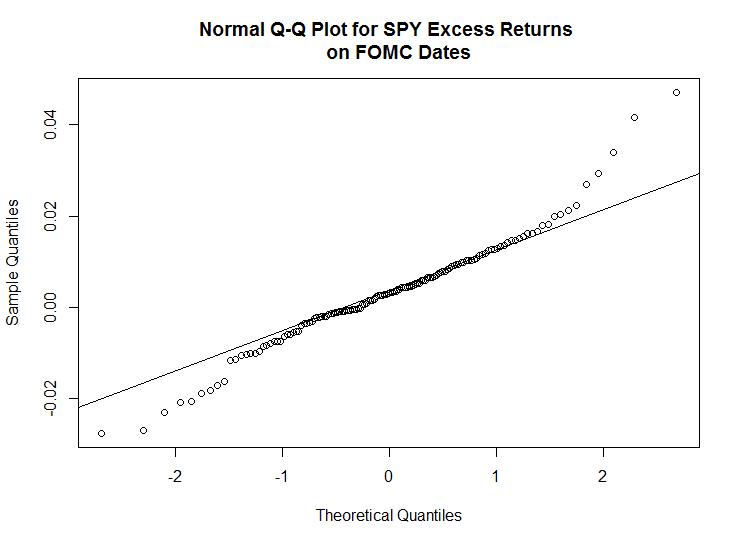 Here are the in-sample summary statistics and a plot of the FOMC excess returns. We’ll check first whether the FOMC returns are normally distributed using the Shapiro-Wilk normality test and looking at a Q-Q plot. As suspected they’re not e.g. fat tails, so we’ll test for statistical significance using a bootstrap confidence interval (CI) for the mean return and see whether it contains zero or not. Based on the various CI’s calculated by the boot package, none of which contain zero, the FOMC returns are statistically significant. For example, the studentized CI is 0.15% to 0.53%. In addition, I thought it would be interesting to test whether there is a statistical difference between returns on FOMC dates and non-FOMC dates. We’ll again use bootstrap resampling to do such a test. Here is the R code for this bootstrap and the R output. Let’s now do out-of-sample testing to see whether the pattern has continued to hold up after the working paper was in the public domain. There are 31 scheduled FOMC meetings from April 2011 to January 2015. 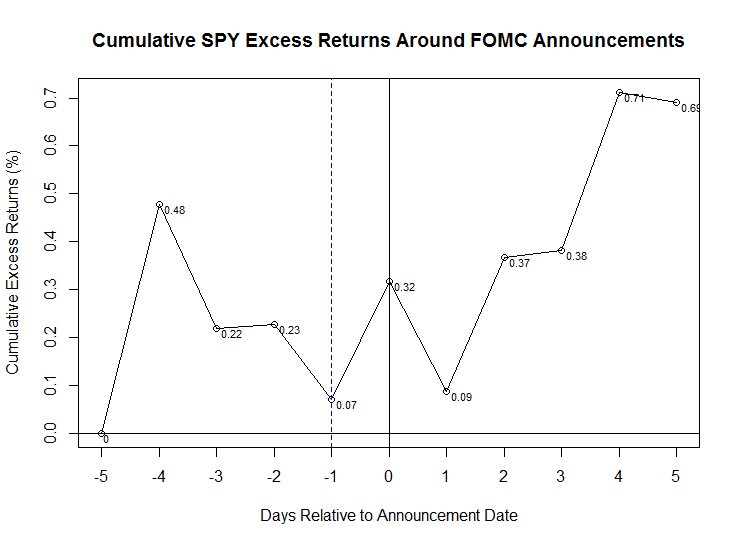 The out-of-sample chart below continues to show a positive drift in SPY returns in the 1-day period before the FOMC announcement, but is less pronounced at about 0.25% (0.32% - 0.07%). Also, the previous positive return on T-1 is now negative 0.16% (0.07% - 0.23%). Here are the out-of-sample summary statistics and a plot of the FOMC excess returns. For the 31 out-of-sample FOMC returns, the bootstrapped studentized 95% CI is -0.21% to 0.82% (i.e. contains zero), so we now can’t reject the null hypothesis that these returns are equal to zero. Similarly, the bootstrapped difference in means 95% CI of -0.25% to +0.69%, indicates we also cannot reject the null hypothesis that there is no difference between SPY excess returns on FOMC and non-FOMC dates at the 5% level. The results above could be due to small sample size. So how large an out-of-sample would we need for statistical significance if the drift does indeed persist? Thinking out of my finance box and into the clinical research box, we can get a rough estimate if we're prepared to make some assumptions e.g normality. This is a common problem faced in clinical trial design but by using previous study results (e.g. effect size) an answer can be derived. In our case, by using the in-sample FOMC and non-FOMC returns, conducting a standard Welch two sample t-test to get the effect size (i.e. the strength of the difference in the FOMC and non-FOMC returns), and with some trial and error, we get a ball park estimate of 120 FOMC meetings or 15 years (120 / 8 meetings per year)! For the in-sample period with 138 FOMC meetings, we were able to derive a similar result of an average pre-FOMC announcement drift of +0.33% using close-to-close data (compared to Lucca and Moench’s +0.49% using 2pm-2pm data). 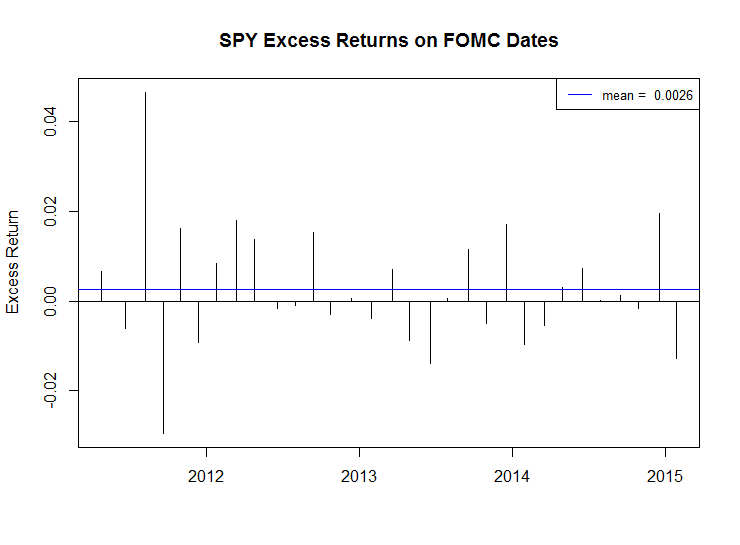 Furthermore, there was a statistically significant difference in the mean returns on FOMC and non-FOMC days. Out-of-sample, the picture is less clear. Based on the much smaller sample size of 31 meetings, there is still a positive drift (+0.25%) using close-to-close returns. However, we can’t conclude now that this or the difference in mean returns on FOMC and non-FOMC days is statistically significant at the 5% level. the FOMC has become more transparent since Lucca and Moench discovered the pattern, and hence there is less uncertainty (risk) regarding monetary policy decisions, which leads to a lower risk premium for such events. See http://www.frbsf.org/education/publications/doctor-econ/2012/august/transparency-lessons-financial-crisis e.g. Click here for the complete R code on GitHub.